Floor 20, Marunouchi Trust Tower Main Building,1-8-3 Marunouchi, Chiyoda-ku, Tokyo 100-0005. Economic growth and the diversity of the Asian market mean that business opportunities are aplenty in the region. Leading translation firm SEAtongue is set to share its insights and tips on how to reach consumers and businesses alike across the continent at the eagerly anticipated LocWorld33 conference in Shenzhen, China. As an exhibitor at the prestigious event booth 13, SEAtongue will be on hand to offer advice on translation and localization to delegates during the event. SEAtongue’s strong presence at the LocWorld33 conference marks the company’s ambitious growth plans in 2017. As leaders in the industry for Asian translation, the firm has made plans to start a new production office in China this year to better serve their global client base and support different time zones, offering customers an even higher level of service than they already experience. SEAtongue has established 8 years ago and its approach to customer service, quality of work, and project management skills mean the firm has fast built up a reputation for exceeding client expectations. The team supports businesses around the world to reach the Asian market and take advantage of the opportunities within the region. LocWorld33 Shenzhen kicks off on February 28th, 2017 and will run to March 2nd, 2017 at the Marco Polo Shenzhen. The must-attend event gives businesses and localization experts the opportunity to learn about the latest technologies, upcoming trends, network with industry leaders, and much more. Among the keynote speeches and seminars at the event is a look at how Chinese consumers have transformed the region and where it’s heading next, the future of language services under artificial intelligence, and how to plan a global content strategy. The combination of insight, networking opportunities, and high-quality exhibitors means that LocWorld conferences have become an essential fixture on the calendars of localization professionals. 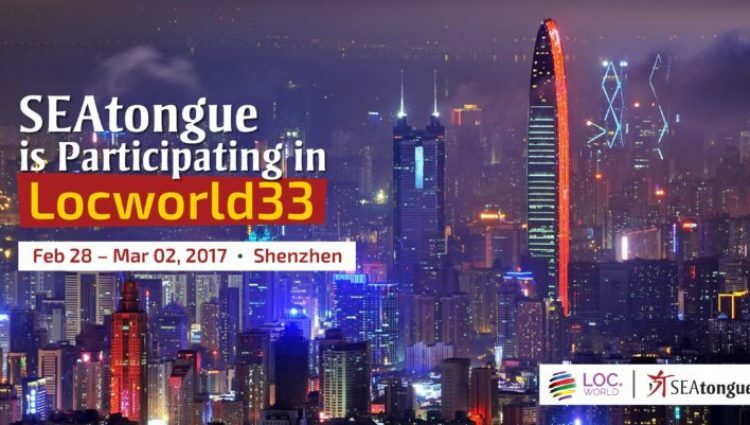 To view and learn more about LocWorld33 Shenzhen, please visit locworld.com/events/locworld33-shenzhen-2017/. SEAtongue is industry leaders in the Asian translation sector and offers unmatched resources when it comes to in-country and in-house native Asian linguists. A client-focused approach, competitive prices, and fast turnaround time have all led SEAtongue to build an impressive reputation among global businesses since launching in 2009. SEAtongue is Exhibiting At The Tcworld Conference 2016! Let us help you thrive. Get a quote and you will receive an estimated cost for the service you need. We invite you to our world, giving you an insight into our history, vision for the future, business areas and competencies.